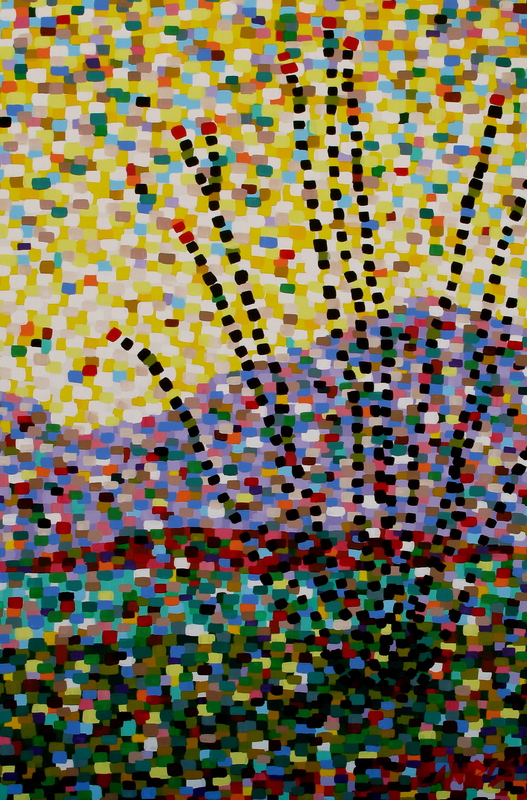 Join me at Hulas Modern Tiki http://hulasmoderntiki.com/ on Monday evening (2/27) where I will be exhibiting my modern pointillism art to support the Arizona Consortium for the Arts. This Mahala Monday, the restaurant/bar will give ten percent of all proceeds to this nonprofit arts organization. Why not grab a few friends and come to downtown Phoenix for drinks, dinner, or both! I would love to see you and you would be supporting a great cause. I have finally completed my last painting for this weekend’s Artists of the Superstitions Studio Tour. Tomorrow, I am taking all my latest works of art (which I have been keeping under wraps all summer/fall, etc.) to the beautiful studio of potter, KimmBerly Ioane. I think her vivid art pots and my pointillism paintings really compliment each other and it is our hope that others will buy both to enhance their home decor. My modern pointillism paintings exhibited are my Happily Working Dachshund Series of six pieces. Each work depicts a doxie doing some sort of human or object related job to make their owners happy. My own doxie is, of course, my muse of many colors! I have chosen to add some contrast to this series by also including some flat hard-edge areas. Depicted here is Scarecrow Doxie. You must come & tell me what you think about each one! Studio Tour maps are at http://www.artistsofthesuperstitions.com/Map_2_color.pdf for printing! Visit us at Studio #3 and then check out other studios nearby. I think you will enjoy the group’s diversity and talent. The renowned Mayo Clinic of Scottsdale has a huge Courtyard Marriott available for their patients and visiting families. Two of my modern pointillism paintings, Ocotillo and Scrub Junipers, in an exhibit sponsored by the Arizona Art Alliance. Consider taking a drive out to this beautiful desert area and visit the exhibit through August 2011. 2010: PUTTING MY ART FIRST! January: My plan is to put my art first over art “support” activities that take up precious creative time. End of year: Actually, I did cut down on the number of art related social networks. I originally had almost thirty sites of which I followed and participated in regularly. Now I am lucky to follow 10!! I started a Pointillism Art Facebook page which keeps me busy; and use Twitter and LinkedIn regularly. My works have been featured in multiple social networks and pieces are occasionally selected for juried online events. I truly enjoy the discussions and conversations/feedback I get and give in the social networking process. In 2010, I successfully began selling my artwork as canvas & paper prints at Fine Art America and became contracted with their Disney/ABC affiliations. I have also found several great business printing sites for printing on metal, canvas-wraps, greeting cards, pillows, clothing, and gifts for my “limited hands on personal sales efforts”. Two of my most rewarding online accomplishments were to coordinate two art competitions which led to actual interviews with the winning artists. See the Eric Dee and Max Eberle interviews. These received lots of press and interest. I plan to do this every year in the future. It’s fun and nice to focus on “other artists” for a change! 2010 was the first year for me to pay for magazine advertising. See Southwest Art‘s December issue. 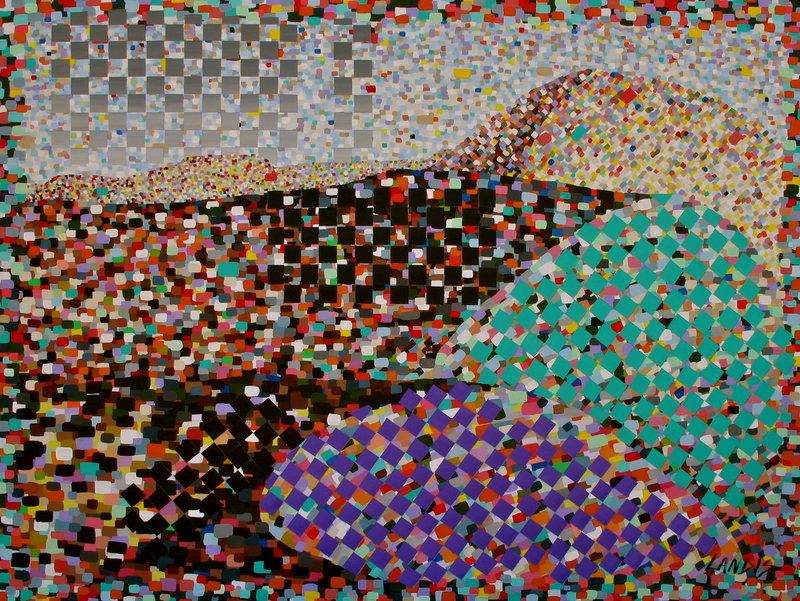 I plan to continue this quarterly in 2011 as new works come about. I joined a international contemporary arts group that facilitates the process for these ads. I’m hoping for some bites from potential customers and collectors. I also cut back on local art group activities and meetings. I didn’t do any shows or sales affiliated with these groups in 2010. This was a relief and much needed reprieve. Initially as a “closet artist” I needed to reach out to groups for support. However, I have found that the friendships I made from these groups is most important and they continue outside the actual group’s parameters. Aside: Okay, I know this sounds like a lot! And some of these activities DID limit studio time; however, I feel good about what I did get accomplished as a “networking artist”. January: My plan is to create so much art that I will be forced to get it out in the public, somewhere other than my studio. End of year: I took the risk of participating in a vanity art gallery and consignment boutique in Scottsdale. However, after several months, they closed and sort of nipped my confidence for a bit. I did, however, apply to several juried shows and was selected for a few both locally and in New York. Other local pursuits have been to engage in local charity (s), museum benefit auctions, and organization awareness building activities. I continue to do a monthly blog for a local arts organization and was feature in their online magazine. They have been wonderful confidence boosters. Who knew giving my art & time away could be so rewarding? I helped organize a new group of women artists and we created new works for a group exhibit at the local state college performing arts center. We plan more group ventures in 2011. I also provided multiple on-site pointillism demos and a month long exhibit of “Elvis Art” at a local museum. I received some good publicity for these events. Publicity means I needed some quality personal promotional photos so I hired a local photographer to get the job done. I recommend doing this every year. January: My plan is to use all my blank canvases that I currently have stockpiled. End of year: There are still a few left but I did not buy many new canvases this year. It’s odd choosing a canvas size first prior to determining a painting’s subject. Usually, I choose the canvas size based on the proposed theme. This was a great challenge. January: My plan is take my old paintings that have served their purpose but are no longer representative of my style and paint over them. End of year: Couldn’t seem to force myself to do this unless they were paintings I never liked at all. Those were easily painted over. January: My plan is to use up all my paint no matter how much I dislike specific colors in order to learn to appreciate new color mixing. End of year: I still have a lot of old paint but did incorporate some in active paintings. My frustration comes from the different fluidity levels of these older paints. Some are just too thick for my needs. What can be done with old acrylic paint? Any ideas? Regarding experimenting more with color mixing: I have engaged color studies while teaching a new student color theory and my creative writing efforts on my book in progress. It never hurts to re-visit & explore the basics. January: My plan is to complete at least one painting each week. End of year: Didn’t happen! Well, maybe once or twice…..What was I thinking? Actually, I may still pursue this goal for 2011. Ha! It never hurts to be ambitious as an artist. January: My plan is to take my dreamed paintings and make them real. End of year: I blogged about it and did create at least ONE dream painting this year! However, I focused more on paintings for specific needs, exhibits, customers, etc. This has proved disappointing and will be a continued challenge for 2011. January: My plan is to incorporate un-interupted “studio time” on my daily planner. End of year: My weekly planner is full of non-art related activities and I didn’t even have a daily planner! However, I do think this is a good goal for 2011! First step: Buy a 2011 Daily Planner! January: My plan is to stick with the plan. End of year: Even though I didn’t stick entirely to my 2010 plan, I did make some significant sales this year and believe that making goals as an artist has helped me dramatically. January: My plan is to avoid deviation unless it increases my productivity. End of year: Ha! Ha! Ha! Avoid deviation? Ha! Ha! Ha! Have fun with your 2011 goals! Once again, I have created an online art contest on Fine Art America! 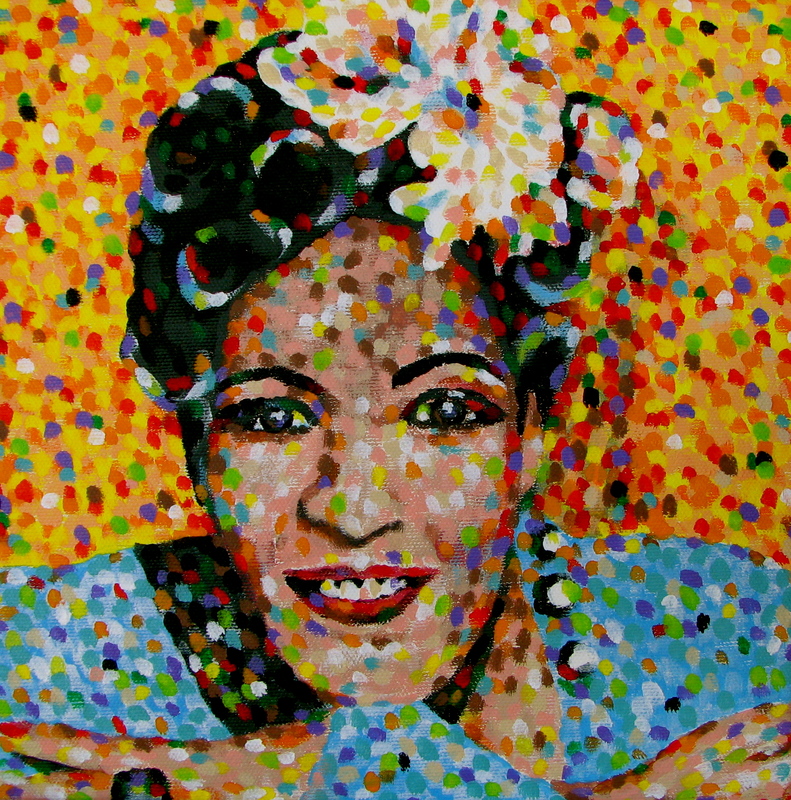 This contest is for pointillism artists entering their best portraits of famous people. Take a look at the 40+ images and vote for your favorite three. I, of course, have entered 3 portraits: “Kissing Elvis”, “Judy”, and “Billie”. But, don’t feel like you need to vote for my work. Each portrait is amazing! Other participating artists are from all over the world and have a special talent. There are both paintings and drawings in pointillism. The winner will participate in an “Artist Interview” with me and will be published on this blog as well as several other sites. Enjoy! 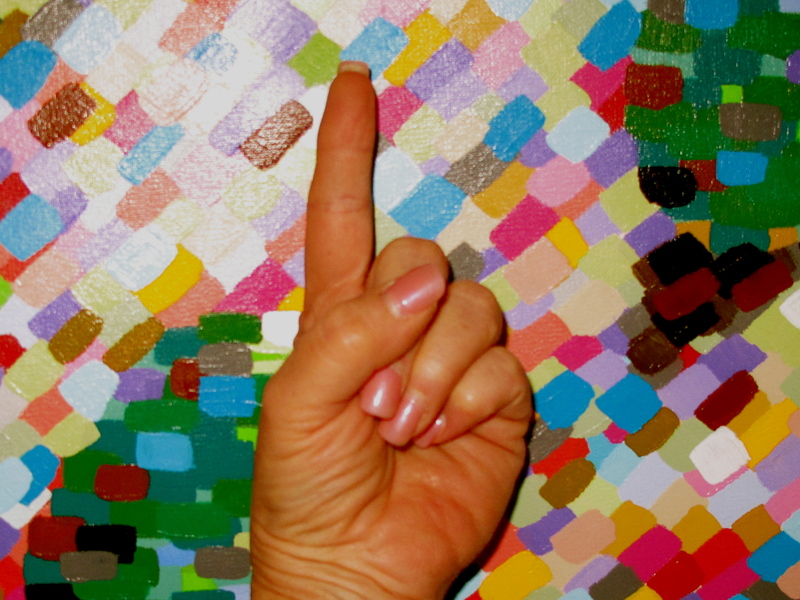 To vote go to: http://fineartamerica.com/contests/pointillism-famous-people-portraits.html?tab=overview Click on the “Vote” tab and you’ll see each entry, one at a time, just click the “arrows” to see them all. Enjoy! Crafthaus is an excellent choice for professional artists, designers & craftsmen/women to display their work, and connect with each other across all fields of interest. A variety of art and craft media are represented on the site, such as jewelry, metals, ceramics, glass, wood, paper, polymers, fibers, plastics, painting, music…. The site was created in May 2008 to foster social interaction and a sense of community. crafthaus currently hosts over 1,700 artist members from all over the world, as well as a number of art/craft related institutions, such as SNAG, The American Craft Council, The Society of Contemporary Art & Craft (Boston), American Craft Magazine, Lark Books, various Metalsmithing and Furniture Societies, as well as galleries from across the US, such as Sienna Gallery, Velvet da Vinci, Gallery Loupe, Luke & Eloy, and many others. All members in good standing are encouraged to post images, videos and blogs of their work. crafthaus features 7 different artists every week, and monthly changing online exhibitions curated by a member from member’s work. There are a number of discussion topics and other resources available, such as Calls for Artists, Workshops etc. Membership rate is $20/year or $35/2 years payable via paypal, cc or check. 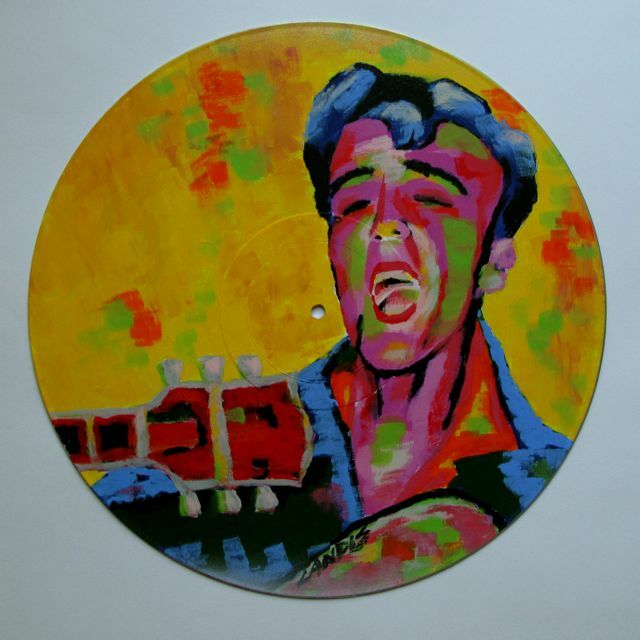 Hey Elvis artists and painters! Enter the new Elvis Presley Portrait Contest if you are a current artist/member of Fine Art America. http://www.fineartamerica.com Digital photo submissions will be accepted till April 24, 2010 and then the three day voting period begins! The winner will be determined by popular vote and will be announced on April 30th. And…the general public can vote! That means you can solicit votes from friends and family in order to win! The actual contest winner will be interviewed by me and will be featured on this blog as well as on the Fine Art America Famous People Portraits Group Page. Artists will get lots of free publicity! These contests can get lots of interest from fans, buyers, and art collectors. So enter those Elvis paintings today. Sounds like fun! 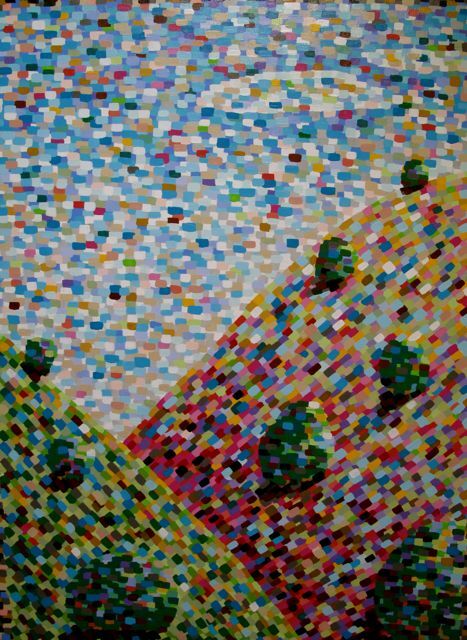 Several of my pointillism paintings are in the Miami Art Works Gallery located right in the middle of the action. The information written below are the words of Ken Boe of Miami Art Works. Once again the annual “Boomtown Spree” is upon us in Miami, Arizona! What is the Boomtown Spree? It is a festival, a street fair, a mining contest, a dance party, an art walk, a poetry reading — PLUS — much more! Boomtown is a full weekend of fun, food and entertainment with family activities for every taste with crafts, music, inter-active arts, face-painting, henna temporary tattoos, hoopsters, poetry readings, dancing and Arizona artists! The Miami Loco Soundstage will take over the parking lot next to Miami Art Works, 509 W Sullivan Street for Boomtown April 16, 17, and 18. There will be many musical acts such as a 4 piece acoustic act, as well as poets lead by Cleopache, chalk art on the pavement, and numerous surprise acts. Last year Miami Art Works thrilled the town with its flying saucer “bed” in the bed race chased by hordes of Zombies. 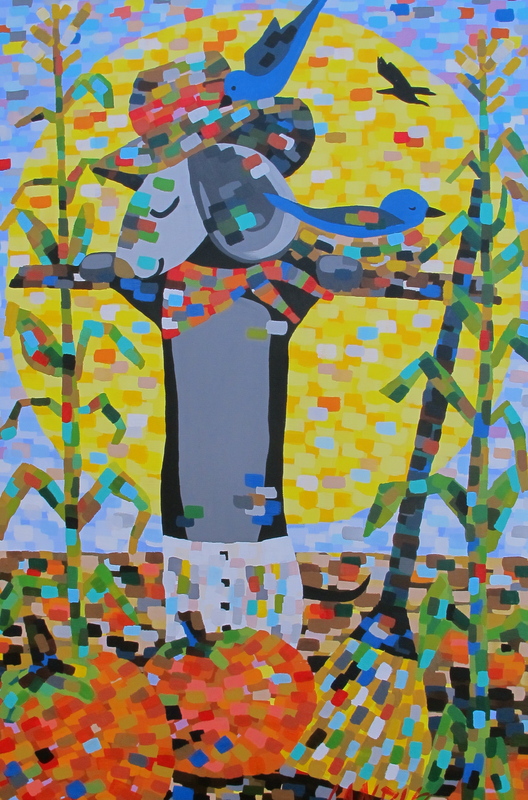 The Fitzpatrick-Barcon building will be open to the public with works by Scottsdale painter George Caramanna. Seventh Fish Studios in the newly remodeled Hughes Drug building with feature the paintings of Miami artist Liz Weibler. The Coppermine Picture Cafe will feature henna and acrylic paintings by Joanna23, and experimental encaustic paintings by Ken Boe, and Miami Art Works will feature their group show of numerous local and regional artists. So if anyone missed the highly successful Miami Loco Art Walk, this is another chance to see much of the work. Weekend activities include: State Mining Championship, Men and Women competing at hand mining skills that made this country great! Youth Mining Contest Sunday. Copper Crawl Hill Run, like no other! 5K and 13K Run up the ridge, through the hills and back down! Sunday afternoon highlights include: The Red Springs Express Bed Race, presented by Copper Cities Rotary! The Keystone Stairs Climb! The Car & Motorcycle Show & Shine! Come Early Friday for the Parade down Sullivan Street at 6:00 PM! Miami “Boomtown Spree” is held annually each April to commemorate this copper mining “boomtown” that was started in 1909, and became the new hometown for over 10,000 miners and their families. The first Boomtown Spree was held in 1939, interrupted by WWII, and disappeared in the 1960’s. By the 1990’s the tradition returned with vitality. Today, Miami is now the new “Boomtown” of the arts, harnessing a new “Art West” spirit of the traditional and the contemporary, with a broad vision of community, diverse cultures, bridging the old with the new. The Town of Miami, located 70 miles East of Phoenix on US-60, the “Old West Highway” travels through some of the most scenic landscape in Arizona. Miami is host to an emerging contemporary art scene, as well as antique stores and great Mexican food. “Ready For Soho“ is a group of talented Arizona artists who are also women. They include: Sharon Seiben, Bernadette Franklin, Danis Garman, Denise Landis, Kathleen Maley, Kathy McClure, Loralee Stickel Harris, Sandy Tracey, and DJ Berard. The exhibit includes paintings, photography, mixed media, and sculpture and will be available for viewing during scheduled stage performances & forums for the month of March on the campus of Arizona State University in Tempe, Arizona. I LAND is Keo Woolford’s hilarious and poignant search for the meaning of his cultural heritage. From his high school days as a football player and discovery of a “Hula God” to his tour in a famous boy band, Woolford’s story will keep you enthralled. Combining elements of traditional Hawaiian hula, hip-hop, Hawaiian talk story and spoken word, I LAND tells a funny, unforgettable tale where worlds separated by geography and culture collide. Please visit the exhibit as you enjoy these performances.